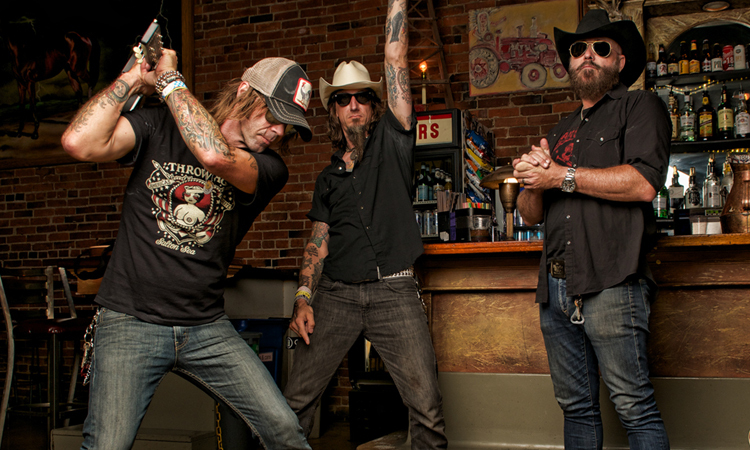 SUPERSUCKERS may be a man down but they’re still very much in the saddle as they unveil the title track from their forthcoming country album. The Arizona via Washington band had long planned to make a country studio album, having already released the live Must’ve Been High country set in ’97 and recorded with WILLIE NELSON and STEVE EARLE. Now Holdin’ The Bag is finally due for release on 16 October on Acetate Records. The whole thing could’ve been derailed when it was announced in June that frontman Eddie Spaghetti was to receive treatment for cancer, which is currently ongoing. Of the title track, Eddie says: “It always surprises me how good a song can turn out to be. When I was making this one up, it never occurred to me that it would be the opening track or the title track of the record. I just thought it was cool that I got the word ‘befuddled’ in there! But this one is an instant classic, picking up where Must’ve Been High left off. Not ones to let a thing like cancer stand in his way, Eddie expects to have the Supersuckers back on the road come September. Pre-order album bundles are available here. Contribute to the Eddie Spaghetti Cancer Fight Fund.